1st and 3rd Wednesday of each month. Dinner meeting, 6.45 pm for 7.00 pm start. Belrose Hotel, 5 Hews Parade, Belrose NSW 2085. Lions help others – we are volunteers who raise funds and provide services for people in need. Lions is a worldwide organisation of 1.45 million men & women in 210 countries. We are in small towns and in big cities and we offer support to those suffering due to their circumstances or natural disasters. We strive to make a difference by honouring our motto: “WE SERVE”. Lions’ has a proud history of achievement in disaster and emergency relief, medical research and local community support. We were involved with the development of the bionic ear, the cervical cancer vaccine, Gardisil, plus a range of other research initiatives involving diabetes and autism. We also raise funds for the local community to assist in youth development, local charities and community services. 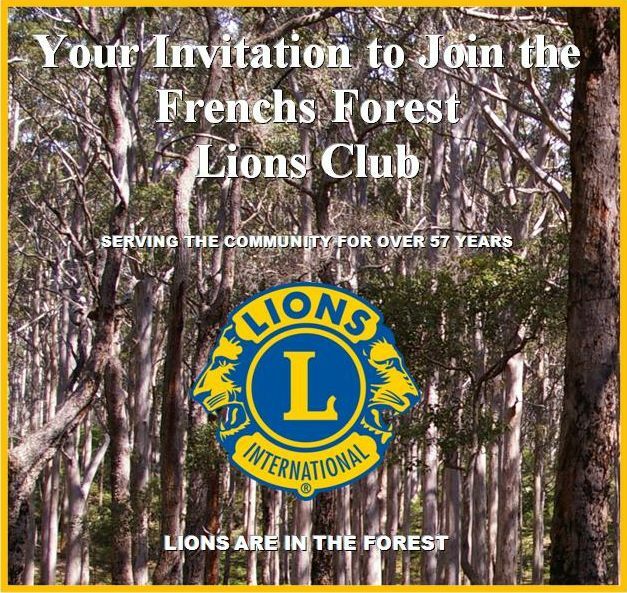 The Lions Club of Frenchs Forest was chartered on 20th June 1961 and we are proud to be one of the strongest clubs in our district boasting an active membership of over 30 members. We are seeking new members who are looking for the opportunity to serve their community through the various projects and charitable programs that Lions support. For information about our club please click the Contact Us link.